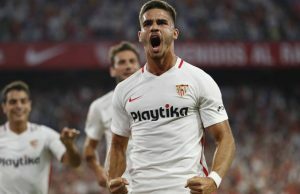 Atletico Madrid have long been considered the favourites to win the Europa League this season, and Arsenal now face the ultimate test after being paired with the Spanish giants in the semi final of the tournament. Arsene Wenger’s charges are essentially out of contention for a top four finish in the Premier League this season, the Europa League remains the club’s only chance of salvaging their campaign, but they have to overcome the best team left in the tournament. Los Colchoneros are in line to finish ahead of Real Madrid in LaLiga this term, had it not been for a challenging summer transfer period in which the club were under an embargo, they would have had a fantastic chance to be in the semi final of the Champions League. Diego Costa’s arrival has rejuvenated the team, they’ve got a truly world class forward pairing to add the finishing touches to moves, defensively there are no questions about Atleti, they are incredibly solid. Arsenal progressed past CSKA Moscow on Thursday, although at one stage they were 2-0 down in Russia and were just one further goal from elimination. Despite lacking individual talent in comparison with the London club, CSKA highlighted the defensive weaknesses that the Gunners have and you feel as though Griezmann and Costa could really punish them. 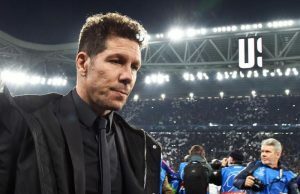 Diego Simeone’s style is one which may test Arsenal with the Spanish club often preferring to trust their defence, sit back in matches and attempt to be efficient on the counter-attack. This forces Arsenal to try and make something happen, they’re a natural attacking team but they struggle against well organised defences. Atletico were the team which no Arsenal fan wanted to draw, in a one-off match it’s possible for any team to win, but over two legs quality often shines through. Wenger’s future is another debate, although it appears to be closely linked to the club’s fortunes in the Europa League. Should he end up lifting his first European trophy with the North London club and secure a passage back into the Champions League, it’s almost impossible he’ll leave the club, essentially he will have completed his objective for the season, exactly like Jose Mourinho did during the 2016/17 season. Henrikh Mkhitaryan will be a sizable miss for Arsenal, his talent would have caused Atletico problems, much of their attacking moves will now have to come through Mesut Ozil. Whilst this is the most challenging tie the Gunners could have received, it’s not a lost cause when you consider how Atleti have performed in the Europa League. Motivation has been an issue for a team that feels they belong in the Champions League, admittedly they are determined to lift the trophy in Lyon at the end of the season, but they’ve found it difficult to motivate themselves for second leg matches after a positive result in the first. Sporting were only one goal from forcing extra time on Thursday evening, this could well be something Arsenal take note of ahead of their semi final. There is another element to this upcoming tie in that it feels like a truly elite matchup, the Emirates Stadium hasn’t been full for a single one of the club’s knockout stage matches amidst a backdrop of continued fan protests against the direction the club is going on. With Atletico visiting England for the first leg on April 26, you’d imagine the atmosphere will be a sizable improvement on past rounds. Simeone’s charges have to keep focusing on their domestic matches, whilst catching Barcelona is virtually impossible, they can’t afford to rest players with Real Madrid just four points behind them. Arsenal can afford to take their eye off the ball in the Premier League, their fixture against Manchester United at Old Trafford falls in-between the two continental matches and it’s inconceivable that Wenger won’t rest players ahead of what is likely to be a season defining tie. If Arsenal are to return to the Champions League, it seems fitting that they will have to pass the ultimate test of facing the tournament favourites, few are giving them a chance of progressing through to the final but motivation will be incredibly high amongst the squad, especially being just one tie away from the final. ← Previous Story Best Bets To Make: Harry Kane over Salah for the Golden Boot? Next Story → EPL Predictions: Tottenham to rub more salt in Manchester City’s wounds?